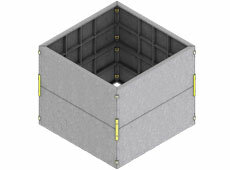 Standard modular ground sleeve panels are 26" tall/deep. When additional depth is required, MGS units can be stacked. Hardware kits for stacked ground sleeves are similiar to the standard kits, with the exception of the use of a modified outside corner clamp configuration to tie the stacked sleeves together. Stacked units are also supplied with industrial adhesive/sealant that is used to seal and bond the sleeves together at the joint.